A couple of months after our fruitless search in Wales, we decided to have a short holiday in Cornwall, so booked ourselves into a small apartment in Cornwall. We arrived at the place and loved the area very much, we spent many hours just looking around the beautiful countryside. We thought it may be worth looking into the estate agents' lists of available properties, just to see what sort of prices they were asking, most of them were way beyond our means, however, we did find one agent who had a few lower priced properties, so we took the handouts which were advertising them, and went back to our apartment to view them, just on the off chance that there may be one which was a likely prospect. We were hoping for a place with a large garden, as Dean likes to grow his own vegetables. Most of the properties on the advertisements though, had small gardens, so it didn't look too hopeful. Then we saw one at Druids Lodge, which we quite liked the sound of, on reading through we saw that this place did have the large garden which we were after, it was also very inexpensive. It was described as in need of some renovations, but did not say just how much, though it did say that because of this it was not suitable for a mortgage. The photo of the property, was not much to look at, but we decided to go to have a look for ourselves, without the agent being present, to start with. So off we went. We arrived at the place, after some small difficulty in finding it, and saw that at the bottom of this garden was a railway cutting, and across from that, a small hill, so the view was lovely. We couldn't see much of the inside without the agent being present, as it was unoccupied, and looked as if it had been so for a very long time, however, the outside looked very scruffy. Whislt we were outside loking around, a neighbour came to speak to us, she was nice and friendly, and she told us a little about the place, and how it came to be on the market. Then a little later another neighbour came out to chat with us, she offered us a cup of tea, for which we were very grateful. We said we were very interested in seeing inside the house, so she offered us use of her phone, to ring the agent to arrange to view it. The agent was available to come immediately, so the neighbour said we could wait with her until he came, and we continued chatting about the area whilst we waited for the agent to arrive. When the agent came, we said our goodbyes, and off we went to see the inside of the house. Is this the one for us? 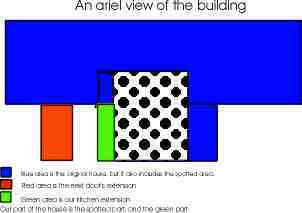 The blue area and the spotted area are the original building, we own the spotted part and the green part. The garden is opposite the parts which jut out.